I cannot express how excited I am to share this post with you! If you haven't seen my Bath & Body Works Autumn Haul video then this is the post for you. 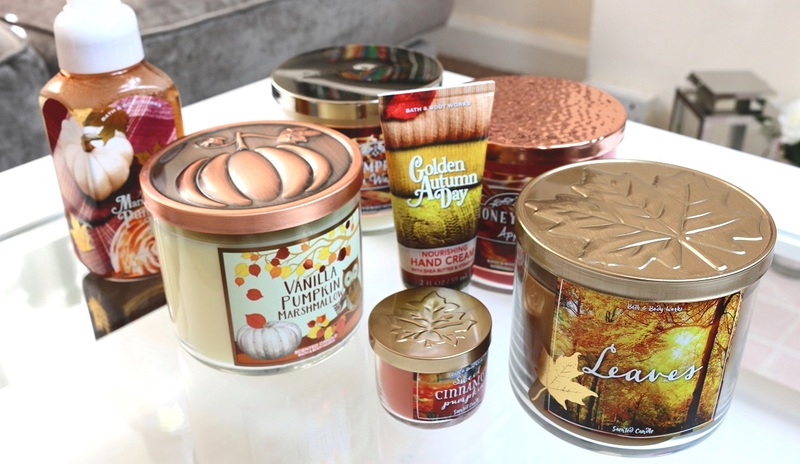 I've managed to get my hands on some gorgeous Autumn Bath & Body Works treats in the UK! Every year I'm just so jealous of everyone getting all the gorgeous Autumn B&BW goodies that aren't available over here. It doesn't look like I'll be making my way over to America any time soon, so I just knew I had to find a way to get all the Autumn goodness! So I asked Twitter and a lovely girl replied saying I should use the service GoSend, so that is exactly what I did - and here is the outcome. Go Send are a shipping service and in a nutshell, they give you an American address you can get things posted to, then Go Send will send it to you in the UK. Go Send are the middle man. Enough of the boring details let's talk about candles! 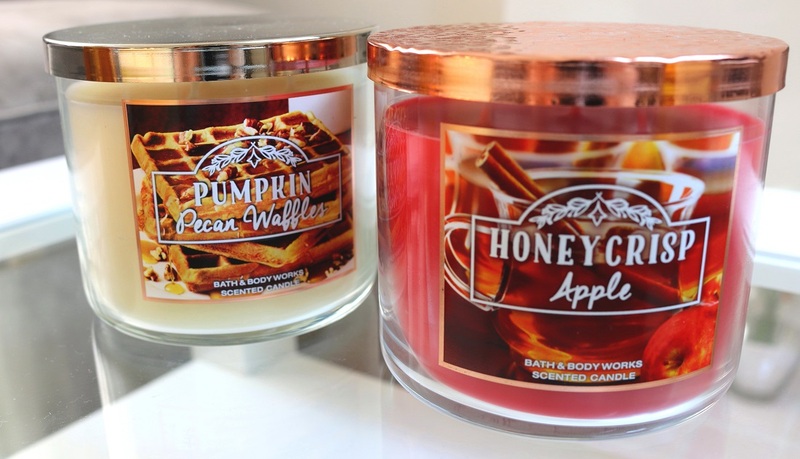 I found it soooo hard to choose what candles to pick, B&BW have so many Autumn candles that sound so delicious. After probably about an hour on the site, I managed to make a decision. The first candle I thought just sounded delicious was Vanilla Pumpkin Marshmallow. This is such a cute candle, it's a lovely cream colour so it looks great everywhere and it has just the cutest bronzed pumpkin lid! This looks so festive. Of course this smells delicious, sweet and creamy with a warm toasted marshmallow scent. Next I wanted something that just screamed Autumn, so I picked up Leaves. To me this is literally Christmas in a jar! It's a lovely spicy scent, with a fresh red apple hint to it. This candle is very warming and indulgent. If you've ever been to Hamleys at Christmas time, this is exactly what this smells like! Next I thought I'd pick up something more fruity and fresh and I had my eye on Honeycrisp Apple. To me this smells exactly like LUSH's festive bath bomb, So White. It has a gorgeous fresh fruity apple scent that I think everyone would love. This would be a gorgeous gift, it's sweet and fruity - how could you not love this!? The last 3-Wick candle I picked up was Pumpkin Pecan Waffles. This is another sweet warm Autumn scent. It will make any room so cosy and warm with it's Maple Syrup waffle scent. If you love a sugary scent, this is the one for you. I also picked up a mini candle because there are just so many scents to choose from, I wanted to try as much as I could without spending hundreds of pounds so I picked up Sweet Cinnamon Pumpkin. To me Cinnamon is just such a festive scent, the spicy warmth makes any room more cosy. This little cutie also has a creamy vanilla hint to it so it's not too overpowering. This is the perfect blend of sweet and spice. One of the other products I wanted to try from B&BW were the Gentle Foaming Hand Soaps. These just sound amazing and I chose Marshmallow Pumpkin Latte. I love the sweet toasted smell of marshmallows and I love that they've put a pumpkin latte festive twist on this. The hand soap comes out so creamy and soft in a luxurious foam. This is so creamy on the hands and smells amazing! I wish I picked up so many more of these! Last but not least I got myself a hand cream as I was in desperate need of one with the weather changing. I chose Golden Autumn Day. This is such a beautiful fresh mandarin scent. The cream is soft and luxurious and the scent lasts forever. I've really enjoyed using this and I can't wait to try more. So that's all my Autumn Bath & Body Works goodies I picked up. I can't wait to make another order! They have so many amazing scents and their products are beautiful and such great quality. There's always so many great deals on the site, so if you're after some new festive treats, definitely try Bath & Body Works! UK beauties we can get our hands on these gorgeous treats, just use Go Send! 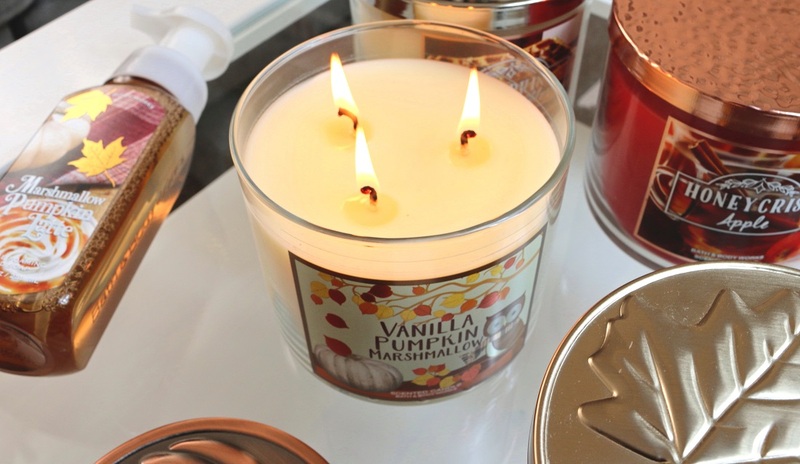 What are your favourite Autumn scents? Categories: Autumn, Bath & Body Works, Candles, Haul, Lifestyle, Review, YouTube. I paid about £40 for shipping with DHL. Once your order is with GoSend they give you a list of shipping company's you can use, This was the cheapest and I got it the next day! (although I did have to wait about a month for GoSend to process my order before I could choose shipping). I'd recommend it though, I'm going to get some Christmas items too. I thought I'd make the most of it, we can't get them in the UK so you might as well get a bigger amount shipped:) Ooooh I'd like to try Autumn next! I can't wait to try the Christmas range. I need to get myself to a bath and body works store!! 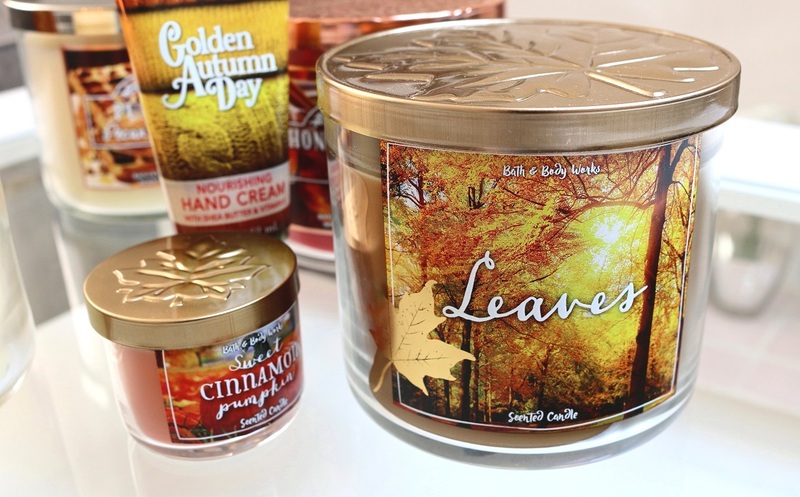 The Leaves candle is my favorite! So glad you found a way to get these goodies sent to you! The products look well worth it. I know, I'm obsessed now. It's going to be an expensive new habit, woops! The vanilla pumpkin marshmallow sounds amazing! !